It's Holy Thursday and i wanted to share this. 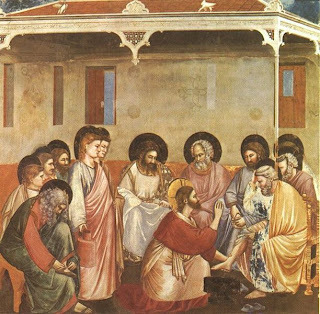 In Roman Catholic Church, the ritual washing of feet is now associated with the liturgy of Holy Thursday, the day that celebrates in a special way the Last Supper of Jesus, before which he washed the feet of his twelve apostles. Evidence for the practice on this day goes back at least to the latter half of the twelfth century, when "the pope washed the feet of twelve sub-deacons after his Mass and of thirteen poor men after his dinner. From 1570 to 1955, the Roman Missal printed, after the text of the Holy Thursday Mass, a rite of washing of feet unconnected with the Mass. The 1955 revision by Pope Pius XII inserted it into the Mass. Since then, the rite is celebrated after the homily that follows the reading of the gospel account of how Jesus washed the feet of his twelve apostles (John 13:1-15). Some men who have been selected - usually twelve, but the Roman Missal does not specify the number - are led to chairs prepared in a suitable place. The priest goes to each and, with the help of the ministers, pours water over each one's feet and dries them. At one time, most of the European monarchs also performed the Washing of Feet in their royal courts on Maundy Thursday, a practice continued by the Austro-Hungarian Emperor and the King of Spain up to the beginning of the 20th century.